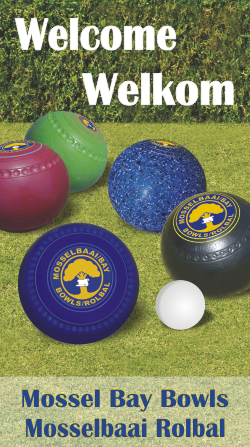 At Mossel Bay Bowling Club we encourage bowlers of any age to participate in this healthy and challenging sport. We offer free coaching for children aged 11+ and assist them with equipment so that they can get started. Our young players play in various club and district youth competitions, including national tournaments. Our club was fortunate to have two of our young players in the Eden teams that participated in the 2016 Nationals! 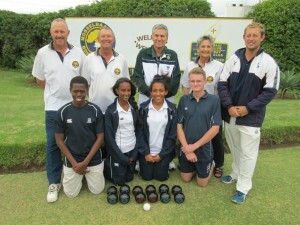 Saturday 10 October 2015 saw the inaugural Interclub Under 19 Bowls Challenge at the Mossel Bay Bowling Club, with two teams from Mossel Bay, three from George Bowling Club and one from the Outeniqua Bowling Club taking part in the all-day event. They played three trips games (three players per team) to decide the three strongest junior teams in the Eden District. Right from the first game it became obvious that the very experienced teams from the George Club would prove a serious challenge to the rest of the teams, so it was no great surprise when they walked off with all the medals as well as the club trophy at the end of the day. What was a surprise however, was how strongly the less experienced teams fought back and refused to give up – a lesson to the adult spectators in “vasbytvermoë”. Ultimately they were the winners as they gained valuable experience playing against their strong counterparts. It didn’t kill them, it just made them stronger. The players had to choose names for their teams, which introduced a fun aspect to the day. With names like “The Smooth Guys”, “Bowls of Steel”, “Bayrollers” and “Touchers” there were constant jokes popping up and nicknames mysteriously appeared on the score boards. It all helped to make the day fun for everyone. A full-day bowling tournament like this is very exhausting work, so between games the young players enjoyed the usual good food and refreshments for which our club is famous. The pasta, cold drinks and snacks kept them running on all cylinders all day. Thank you to our ladies for the excellent food and especially thank you to the three club members whose generous sponsorship made the event possible. 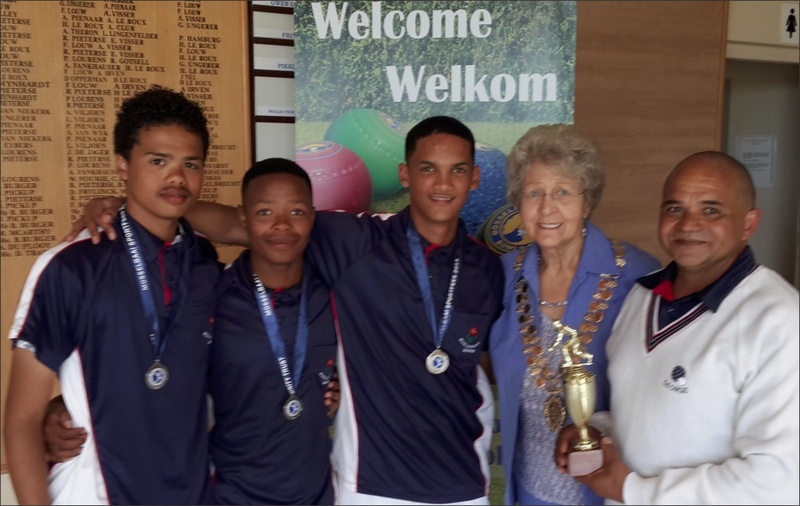 The tournament was run as part of the Mossel Bay Sport Festival, so the junior players were privileged to have our Mayor, Ms Marie Ferreira, address them and hand over the bronze, silver and gold medals to the players. The manager of the George Club teams, Hilton Prins, proudly accepted the shiny new floating trophy on behalf of this club. In her address councillor Ferreira expressed her pleasant surprise at seeing such a large group of teenagers playing a game usually associated with older retired people. The players are becoming quite used to such a response and will point out that bowls is growing rapidly in popularity with younger players all over the world. It may just be THE sporting code where junior players have the best opportunity to progress rapidly to higher levels as there are active programs in place a district, provincial and regional levels to identify young players with the skills and drive needed to excel in this sport. 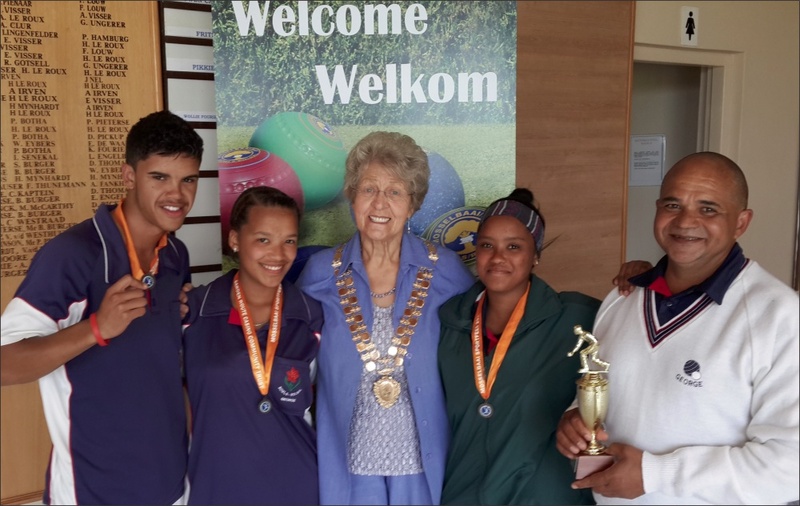 The Eden District boasts with Springbok bowlers and administrators who represent this sport at the highest levels, so it is no wonder that our local players have ambitions to achieve more. We challenge other bowling clubs in the Eden District to enter under 19 teams in the next tournament in 2016. These young bowlers will be the ones who will be keeping bowls alive as an active and vibrant sport when we are all long gone. To this end, Mossel Bay Bowling Club welcomes young people between the ages of 10 and 19 who would like to learn to play a fun, challenging sport to phone 072 768 5662 for more details. with manager Hilton Prins and Councillor Marie Ferreira. Schools within the Eden District competed recently for the Talisman Inter-schools Floating Trophy, with the final taking place at the George Bowls Club on Saturday 15 August . This year newcomers Curro High School from Mossel Bay surprised everyone including themselves as they put pressure on the very experienced and highly-talented team from George High. Ultimately though it was the experience of the George High players which was the deciding factor and they finished as the overall winners, with the Mossel Bay team as runners-up. Congratulations to Keenan Williams, Darren Lindoor, Reagan Meas and Leighton Prins from George High on their victory and to the Curro Team of Athenkosi Nguta, Ling-Ling Yu and Londa Khanyile for playing an excellent game. The experience gained in this and other recent tournaments has been of immense benefit to our young players, resulting in them playing with a level of maturity and skill far exceeding all expectations. The Curro under 19 team and the Mossel Bay Bowls Club wish to thank the organisers and sponsors for hosting such a well-run competition. 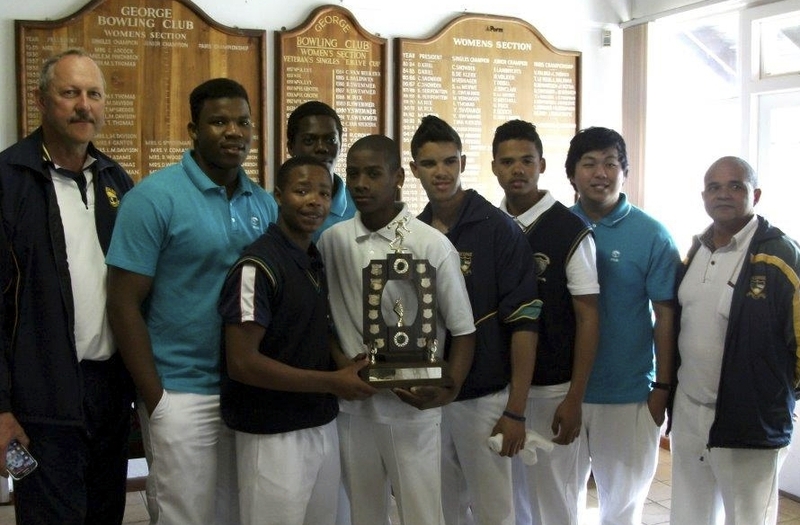 Watch out for the Curro team in 2016 – they have their eye on that trophy! Owen Calverley (Manager, MB), Athenkosi Nguta (MB), Keenan Williams (George), Londa Khanyile (MB), Darren Lindoor (George), Reagan Meas (George), Leighton Prins (George), Ling-Ling Yu (MB), Hilton Prins (Manager, George). 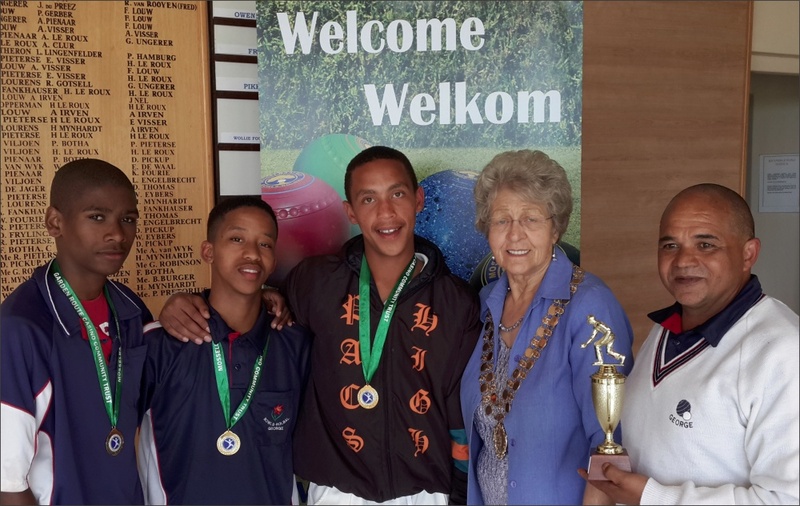 Mossel Bay Bowls Club has launched its own Junior league, with the first eager group of 12 young players from Curro school having already started their training. 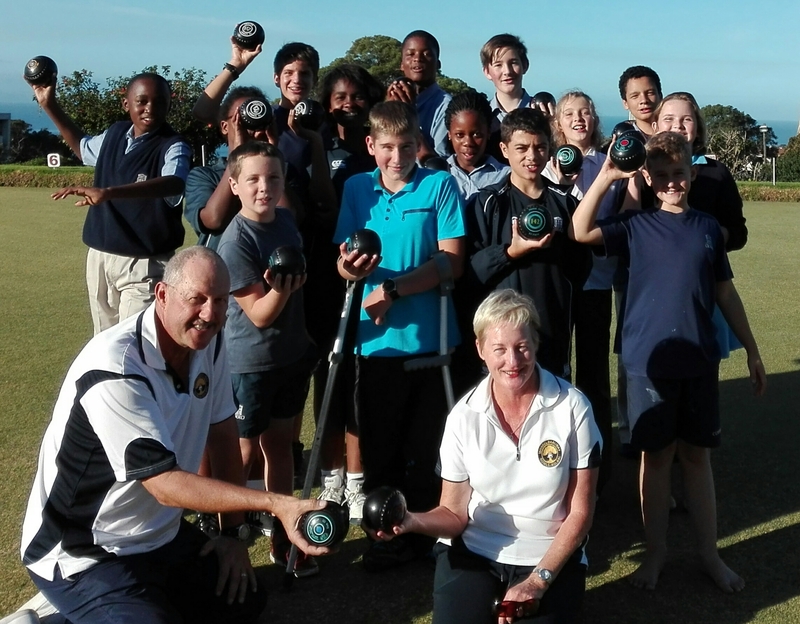 Other schools in the area have also shown interest in offering lawn bowls as an optional school sport, recognising the benefits to learners who might not readily participate in other main stream sports activities. Lawn bowls teaches strong self-discipline and young players also derive the obvious benefits of improved fitness and increased confidence. Gone are the days of bowls being a game just for retired people. This local initiative of the Mossel Bay Bowls Club is fully supported by Eden Bowls and Bowls SA, which means our young players have a clear path to achieving not only district colours, but also have a shot at wearing the Green and Gold. The recent Commonwealth Games in Glasgow was a good example of how the average age of national teams is coming down rapidly, with a number of highly talented young players representing their countries. The president of Eden Bowls, Trevor Davis, himself a Mossel Bay resident, was in the news last year, when he was selected to officiate at the Commonwealth Games finals. Trevor is very passionate about encouraging young talent and recently visited a training session at the Mossel Bay Bowls Club to hand over sets of sponsored bowls to the coaches. This sponsorship opens the way for young bowlers of all ages and backgrounds to participate in a sport which challenges the mind, body and spirit equally. President of Eden Bowls Trevor Davis (centre back) handing over the sets of training bowls to the coaches and eager players. With him in the photo are Yvonne Elley (MB Bowls coach), Bennie Coetzee (Curro coach), Vanrenen van der Westhuizen (president MB Bowls Club), Owen Calverley (MB Junior Bowls coordinator) and young players Londa Khanyile, Kizia Frans, Heike Frans and Jeandre Brits.